I am back, with yet another flower card! But this time I am using Technique Tuesday! 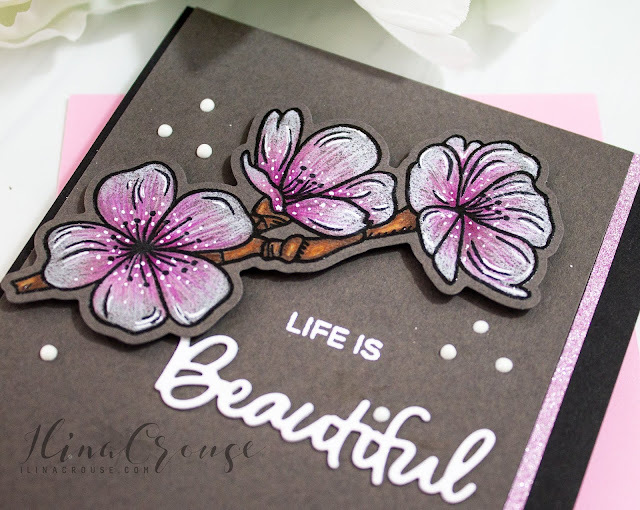 For my card I used the Cherry Blossom set along with the coordinating dies. I stamped the image onto dark gray Mi Tientes Canson paper using MFT Extreme black ink and colored with my Chameleon Pencils. I had my paper still in the MISTI while coloring and made sure it didn't move. 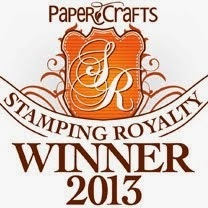 Once done, I inked my stamp using VersaFine Clair Nacturne ink and stamped over it ,then embossed with Ultra Fine embossing powder. I added some details with white gel pen. Next I die cut Beautiful twice from white card stock and adhered them together. Before I die cut the sentiment I sprayed the card stock with Sparkle shimmer spray. On another piece of the Mi Tientes paper I stamped LIFE IS and embossed in white. I assembled my card and added some Nuvo drops in white and glitter washi to add extra interest. This fun card is part of a blog hop between Technique Tuesday and My Sweet Petunia. Your next stop: Latisha Yoast! 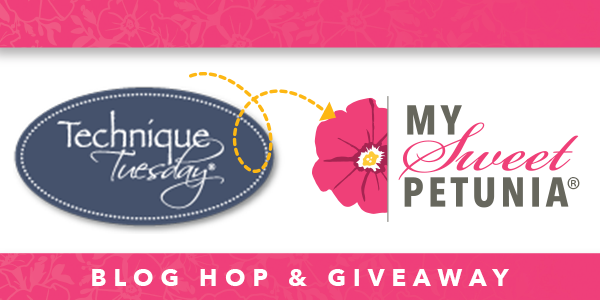 We will choose two lucky commenters from the hop to win one of two prizes: a $50 shopping spree at www.mysweetpetunia.com and a $50 shopping spree at http://techniquetuesday.typepad.com/ - they must leave their comments no later than Monday, May 28th, at 11:59 PM Central time and winners will be announced on Tuesday May 29th, on the Technique Tuesday and My Sweet Petunia blogs. So pretty! Love those blooms! 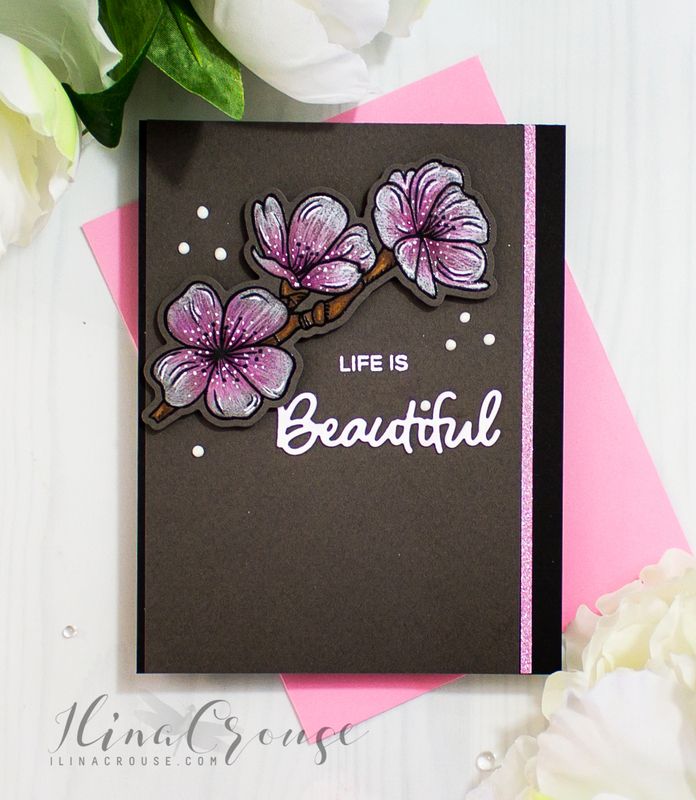 I love how those blooms just pop right off the card base. White on that dark brown with a splash of pink is stunning! We were blessed to go to Japan for our anniversary, a big one coming up. Everything "cheery blossom" or even flowers on a branch, are in my heart right now. This one is really beautiful. Thanks for sharing! I love the coloring on your flowers... This whole card is just gorgeous. Such Happy colors! 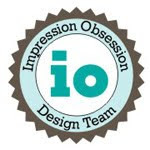 Thank you for sharing your design. What a lovely card. The flowers stand out so well on the background. Your card is stunning as always. I can't wait to see the video. Thank-you for sharing the Mi Teintes paper. You made it into a stunning card. This beautiful card is my new favorite! 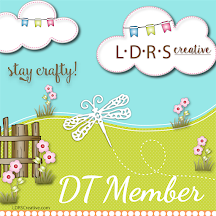 very creative card - so pretty!! Such a pretty card! I love your color palette. The detail on your flowers is beautiful. Can't wait for the video! So pretty! Can't wait to see the video!!! These colors are stunning together? Great choice! Beautiful against the dark background. love the flowers and your coloring! Such a striking card! What a beautiful contrast and the flowers are so enchanting ♥ TFS! Oh I love this card. I love the flowers (I do the animal house stamps and dies I may need to change to the flowers) I love the idea of re-stamping the image once it's colored. Beautiful card. That’s such a wonderful card !! I love black base so much ! It’s so elegant. I love the use of the dark colored paper and colored pencil. What a nice effect! Your card is beautiful! I love colored pencils on dark card stock and you colored the TT flowers beautifully. Gorgeous card! Beautifully colored flowers, love the texture from the pencil. The charcoal paper really makes the blooms pop. Your card is stunning ! The coloring of the flowers is just incredible !!!! That's my favorite paper too. Love how the flowers pop off the page. Such beautiful colors! Gorgeous card! Love the colours - they really make the flower pop. A beautiful card! Love the colors. Beautiful details on these flowers. Ilina, your CAS card is absolutely gorgeous. Love your coloring on those flowers. Beautiful, Ilina! I love the pencil coloring on the dark cardstock. It brings such a vibrancy to the blooms! Beautiful card! I love how you made the flowers really pop on this dark background. Simple and gorgeous!!! Love how the colored pencils show up on this dark card stock! So lovely. Will try this. Oh my goodness, this is beautiful!!! It looks ethereal on the dark gray background paper! Great work! 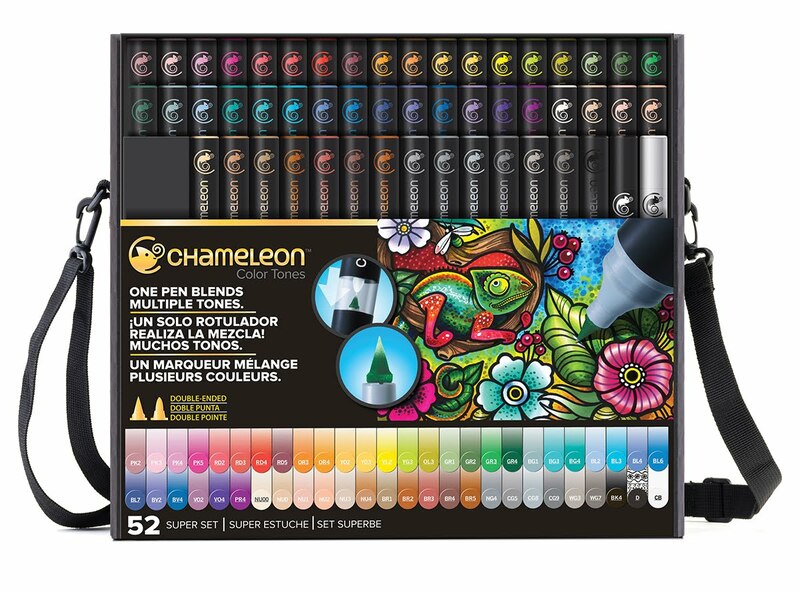 Am loving all of your fabulous details like with the white gel pen! Thanks for the inspiration. These are such great ideas! Very pretty flowers! 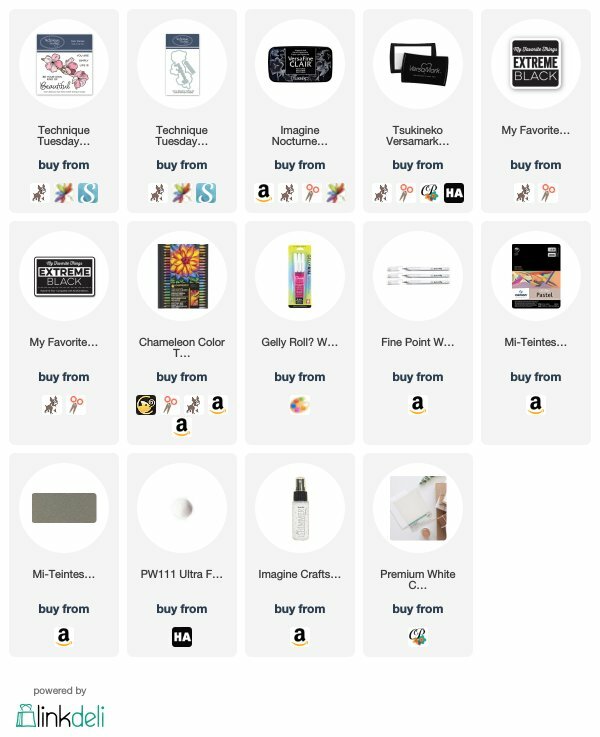 Thanks for the chance to win and sharing. Love that coloring on the dark cardstock! So pretty! These florals are just so beautiful on this stunning card. Thanks for sharing your creativity. 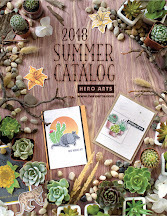 Hero Arts Summer Catalog Blog Hop and Giveaway! Concord and 9th May Release is LIVE!